Columbia Academy is unwavering in its commitment to providing the outstanding education. We believe that learning is a life long process, developing confidence enhances learning. Each child is a unique individual, who has both strengths and weaknesses and requires individual attention. As a result, all of our individual and small group tutoring programs are designed to address individual needs of every student. Our teaching philosophy is based on the developmental approach to education, learner-centered, with emphasis on group interaction and hands-on, practical training methods. We value the uniqueness and individuality of all students and allow them to develop at his/her own pace. For each student, learning strategies are developed that maximize the student's strengths. We are committed to excellence in education. Regardless of the current achievement level, we help students meet their goal for academic success. Alla Iovel, MM, MA is an honors graduate of the Master's Degree program of the St. Petersburg Conservatory (Russia), and have completed her second Master's in music pedagogy at the Pedagogical University in the Ukraine. She also graduated from the Nicolai Rimsky-Korsakov State College at St. Petersburg Conservatory for gifted students. She is the founder of the Elite International Music Competition - an annual event for pianists and all instrumentalists, vocalists, and small chamber ensembles ages 6 through 22, who have successfully passed an audition and received an invitation to perform at the Winners Recitals at Carnegie Hall. She has been recognized by the Music Educators Association of New Jersey as a High Honor Teacher, awarded a Certificate of Excellence by the American Concert Alliance Golden Key Music Festival, has received many national awards in the Ukraine, and appeared in Marquis Who's Who in America. Mrs. Iovel is a former permanent member of the Ukrainian Government Inspection of the Board of Music Education for control of teacher's qualifications of all music colleges. 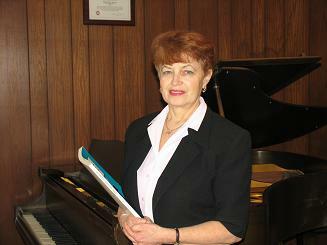 She has developed and published a Curriculum for teachers of all music colleges and universities throughout the Ukraine. Many successful students have studied with Mrs. Iovel privately during her pedagogical career at schools of music and colleges, both in the Ukraine and in the United States. Her students are regular prize winners in numerous piano competitions at local, state, and international levels. Over the years, many of her students have been motivated to pursue professional careers in the field of music. Mrs. Iovel applies patience and encouragement to motivate her students to learn the piano and to make learning an enjoyable experience. She always takes an individual approach to each student, and her selection of repertoire always reflects the musical interest and personal preferences of the specific student. Her students acquire theoretical knowledge and learn practice techniques that develop their ability to maintain steady progress. Our highly qualified math tutors provide a dynamic and fast adaptive learning environment ensuring your child’s success. ● To help students develop confidence and maximize their potential so that they can interact successfully, productively, and happily with society. We provide high quality and affordable tutoring that allows students to improve their academic performance in school almost immediately. Our professional teachers and tutors strive to enable all children to experience success and achieve their full potential academically and socially. Our academic programs help your child build a solid foundation for his/her future.